Extra pistol cases or finger pad gun vaults are handy in a vehicle for those times when you enter a prohibited carry zone. Every firearm owner needs to protect his or her weapons from unauthorized access with a safe that can be bolted down or secured so as to prevent loss. The finger top models allow instant access to a loaded handgun, even in the dark. Frequent loading and unloading subjects the weapon and ammunition to unnecessary wear and the owner to added safety issues. Many firearm discharges have occurred in police locker rooms. Check the local laws governing when and how to carry or transport pistols, rifles, and shotguns. Measure the length of your gun, then add about an inch. All safes can be defeated by an experienced and determined professional thief. At least we can afford to protect children and the ones we love with a gun safe. Besides, even an inexpensive model may help protect you in a court of law. 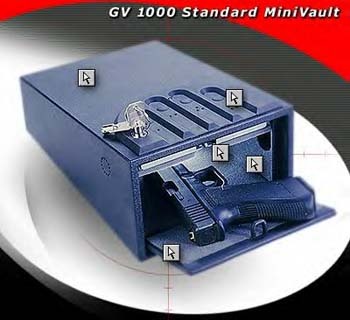 This is the smallest, lightest, and least expensive fast access safe. In a tense situation, fine motor skill degradation may cause fumbling with keys and ammunition loading. This safe has a four finger slot access pad on the top which you can program. We recommend a code using the minimum of strokes performed by the strongest fingers. Practicing frequently and in the dark will leave nothing to chance. Also, you could use a cable with a lock to keep it from being carried off and allow it to be moved to different locations. Never store rifles or shotguns with live ammunition in the chamber. The internal parts that fire the gun are not blocked by external safeties as they are on most high quality pistols. Accidental discharges with rifles and shotguns are much more common, even with the safeties on. Prices do not include shipping and are subject to availability and mfg increases. Please contact us for any other needs. Make your shooting experience more enjoyable with these versatile swivel clips. Use Ammo-Safe Bore Inserts for storage, practice, and protecting the firing pin while dry firing. 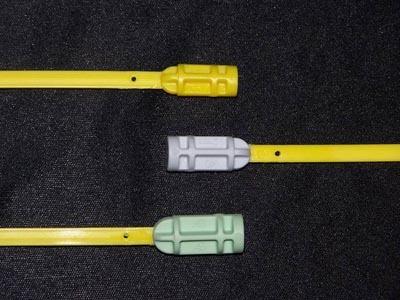 This product practically eliminates the chance of a negligent discharge. Hand gun $2.99 Long gun $4.99. Arm the republic with dependable quality, value, and knowledge.